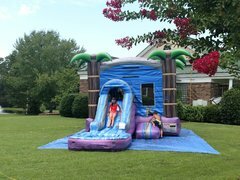 The Mini Purple Crush Combo with Pool in beautiful cool colors of blue oasis and purple crush are adorned with palm trees that sway in the breeze as your little guests play. A cool misting system keeps the fun going even in the summer heat. Slip down the attached slide to your very own pool of refreshment right in your own backyard. This smaller unit is perfect for the smaller residential back yard. Don't forget to add on your favorite Fun Foods to really take your party to the next level! Carolina Fun Factory offers the very best in entertainment to your guests. Requires a quality water hose no less than 100ft in length pulled to setup area before arrival. Requires a three-prong electrical outlet within 100 feet for blower power. Requires level ground with no overhead obstructions such as power lines or tree limbs. No sliding head first, rider should be seated on their bottom, arms folded across chest and slide down feet first. Pool area should be clear before next person slides down.